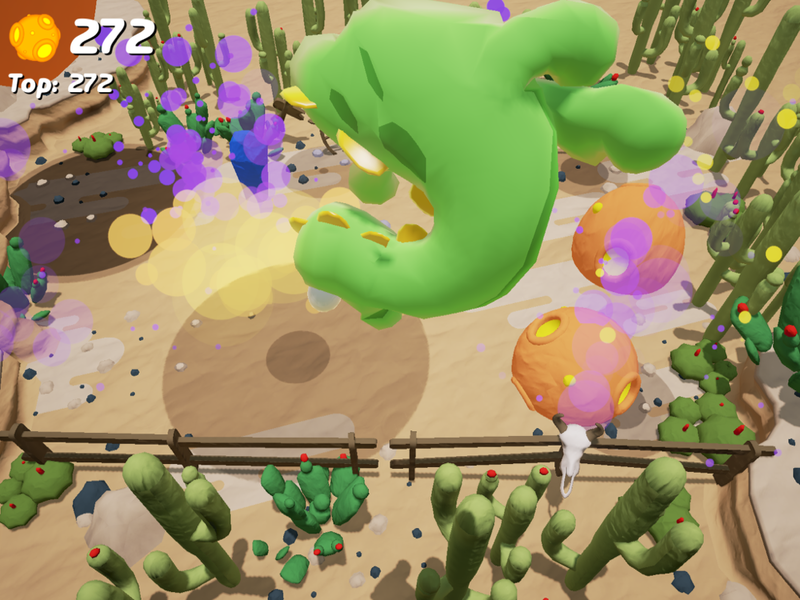 Danger Dodgers Review: Whoosh! Tralalala! Wheeee! I don’t write too many reviews of free games, because I figure I can just recommend those I think are worth trying, and players can decide for themselves if it’s worth their time. But occasionally a free game comes along that does everything right and I’m enjoying it so much, that I feel the need to review it. 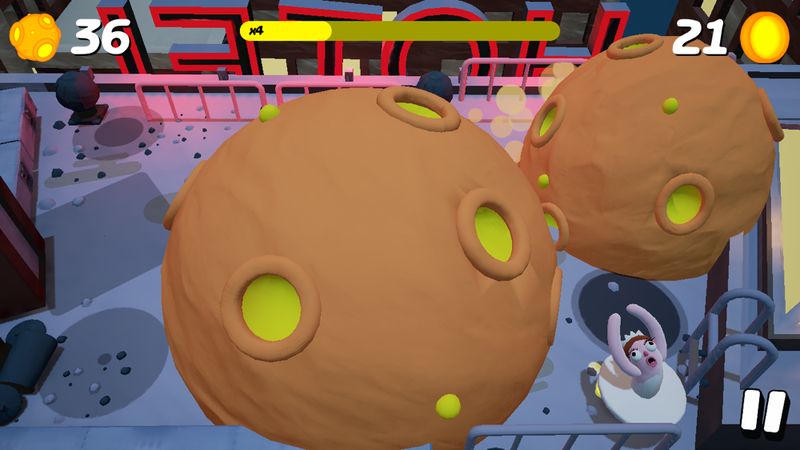 Uppercut Games’ newly released Danger Dodgers is one such game. I got an early copy of Danger Dodgers and have been playing quite a bit over the last week. I’ve tried a lot of the Crossy Road-like games that strive for fair monetization that’s based on collecting new character skins and nothing that affects the gameplay itself. But every week there are new ones that use the “verby noun”-style name and voxel art we saw in Crossy Road. The market is so oversaturated with these games already, that I’ve started to ignore them. But having been a fan of Uppercut Games’ EPOCH. and eagerly awaiting their iOS port of Submerged, I figured I’d give their first free-to-play game a shot. 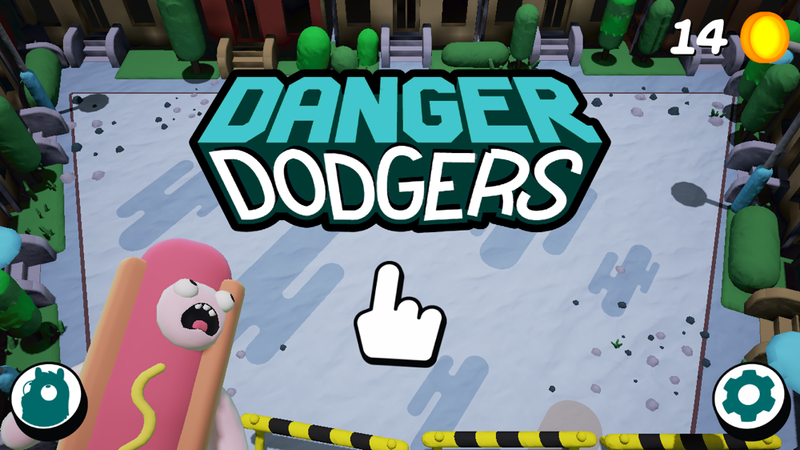 Danger Dodgers‘ name tells you exactly what you’ll be doing, and I’m rather fond of the name and it’s lack of a “Y.” It’s a high score chaser, where you start off playing a long-necked llama looking up at the sky for incoming meteors. Each meteor casts a shadow on the ground, with the inner darker circle getting bigger the closer it gets. 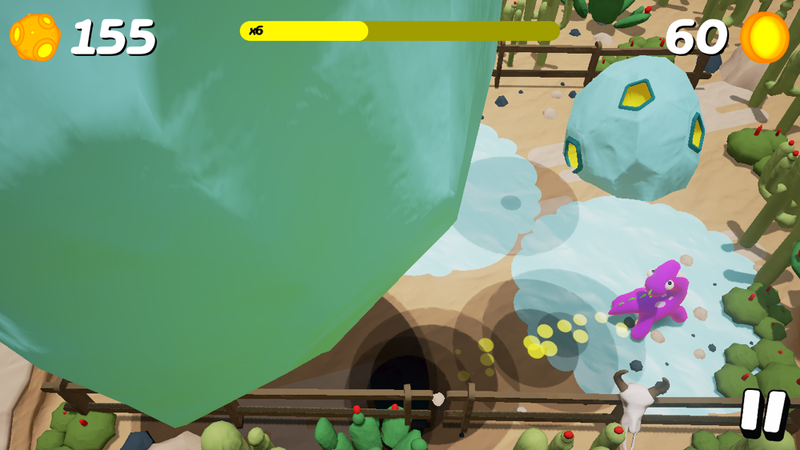 If you’re in that shadow when the meteor lands, it’s game over. Your final score is based on the number of meteors that land before you get hit by one. You use simple tap-to-move touch controls to get your character to go where you want. You can also keep your finger on the screen and drag it to lead him around. But it’s not as simple as that. Standing under a shadow builds up a multiplier. The longer you stand under shadows, the bigger the multiplier gets. So for instance, if you get your multiplier to 8, then every meteor that falls while your multiplier is active will count as eight towards your score. It really adds up! So by taking more risks, you give yourself a better chance at a high score. If you spend too long outside of shadows, the multiplier you built up will go back to zero, and you’ll have to build it up again from scratch. On top of that, there’s a few other mechanics that come into play. Your character doesn’t always stop on a dime. He slips a bit past the spot you tap, so you have to be extra careful. It’s a fast-paced game that forces you to constantly think on your toes. There are also different types of meteors that have all sorts of effects. Some stay in place, while others try to follow you. 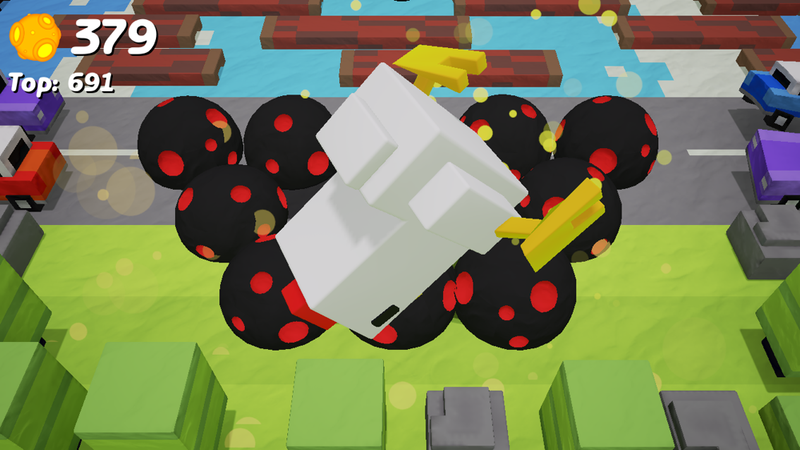 Cubic cheese-like meteors fall faster than round ones. Black ones fall in groups in different formations. Others leave colored trails on the ground, which I believe slow you down if you walk on them. All these things add depth to keep things interesting. 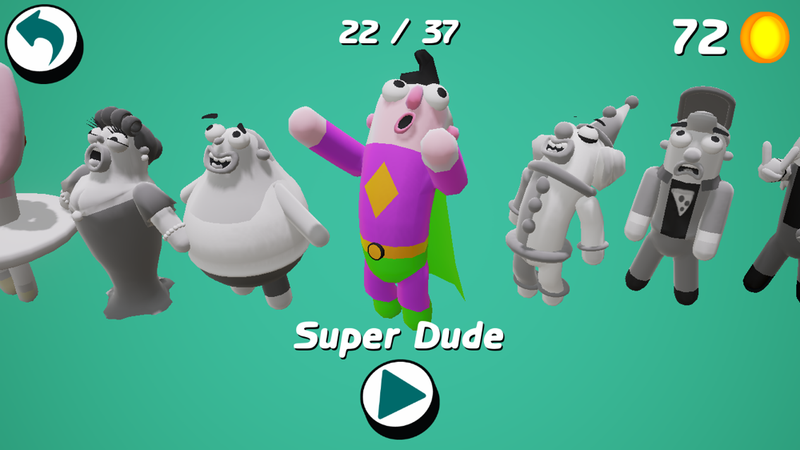 On top of the solid gameplay, the characters are cute and rubbery, reminding me of Wallace and Gromit. They all stare up at the sky and then fly at the camera when they get hit. There are different backgrounds that fit the characters and each one has its own unique sounds. Some of my favorites are Prima the ballerina, the screaming man in a hot dog suit, Super Dude who whooshes around, and Bernadette the oafish-sounding dinosaur. The character selection screen also lets you sample the sound effects of each character so you can decide if you want it badly enough to buy it for $0.99. I’ve also spent a fair amount of time just scrolling back and forth through the character selection screen just to play with their sound effects. Another reason the game has been able to hold my attention is that that there are no continues. A lot of games I wanted to love turned me off with the continues that you can get through IAPs or watching video ads. I like pure leaderboards where I can compare my score to others’ without wondering whether or not they used a crutch. It’s incredibly rare to find even a Crossy Road-like game without continues these days. Even Land Sliders, which released without them, later added them in. It’s a good way for the developers to make more money, but I find it hampers the experience for me. With Danger Dodgers, ads are all opt-in and they only give you coins, which can be used to win new skins from the vending machine. You can also buy a character for $0.99 if you can’t wait for it. There is no way to buy your way ahead through cash or ads. The only way to get ahead is through skill and practice. Sadly, there are no iCloud saves. So if you have two devices, you might want to stick to one so you can collect more characters. But if the characters don’t really matter to you, there’s no reason not to just play on whichever device you feel like using. It does feel a little different on an iPad versus and iPhone, but the iPad has more of a border, so you don’t end up with a huge area to run around. It seems to be balanced well on whatever device you use, but I’ve been primarily using my iPhone. I like that I can reach most of the screen with my two thumbs. I think Uppercut Games have a real winner with Danger Dodgers. It feels like a lot of heart and soul went into it. The gameplay feels fresh and the sound effects somehow manage to provide me with endless entertainment. It’s a free game that does everything right. I highly recommend giving it a download to see if it’s your jam. There’s nothing to lose and you may discover your new high score-chasing addiction. You can download the game here.